With additional reporting by Gloria Tatum and Matthew Charles Cardinale. (APN) ATLANTA — Former Secretary of State Hillary Clinton won Georgia’s Democratic Primary for President of the United States on yesterday, Tuesday, March 02, 2016. She received 71.3 percent of the vote, while U.S. Sen. Bernie Sanders received 28.2 percent of the vote. Atlanta Progressive News had Senior News Writer Gloria Tatum at the Sanders campaign headquarters, and News Writer Austin Stewart at the Clinton campaign headquarters. Clinton received seventy delegates from Georgia, while Sanders received 28. Nationally, Clinton has 1,034 delegates, including most of the superdelegates, while Sanders has 408. In the nine other U.S. states that voted on Super Tuesday, Clinton prevailed in Alabama, Arkansas, Massachusetts, Tennessee, Texas, and Virginia. Sanders prevailed in Colorado, Minnesota, Oklahoma, and Vermont. It was a rainy night for Hillary Clinton supporters, but there were no sad faces at Paschal’s Restaurant on Northside Dr. in Atlanta. The restaurant comfortably handled the crowd of about 120 people. The celebration was not short of high-profile figures on the local and national level. In attendance were U.S. Rep. John Lewis (D-GA), Mayor of Atlanta Kasim Reed; Georgia House Minority Leader Stacey Abrams (D-Atlanta); President of Planned Parenthood Cecile Richards; and Richard McDaniel, National Organizing Director for the Georgia Democratic Party. 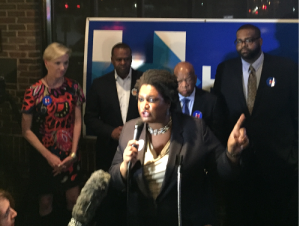 “Today is a victory for the State of Georgia, and Hillary Clinton is going to carry the whole South,” U.S. Rep. Lewis proclaimed. “We are on the side of inclusive politics, Secretary Clinton has been fighting for a long time,” Mayor Reed said. 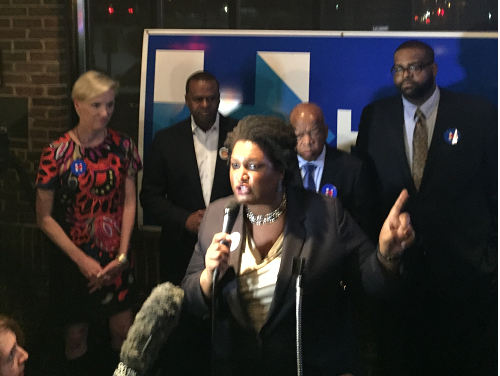 “Our President should not be a punchline!” Rep. Abrams said to enthusiastic cheers, in an apparent reference of the leading Republican candidate Donald Trump, who also carried Georgia. “Hillary Clinton has given this country a lifetime of public service, and her experience is broad,” Abrams said. “Hillary Clinton understands the complexity of the world and has a plan to take us all forward,” Abrams said. Abrams said the key player responsible for Clinton’s success here in the Peach State is Rich McDaniel. “Rich McDaniel was extremely dedicated to this effort, from Macon to Savannah, Rich did a wonderful job,” Abrams said. The Clinton supporters in attendance, a good mix of college age and older political veterans, were more than happy to express their joy. “This is a great day for Georgia, Hillary has the experience we need, and she will bring back the American dream,” Dr. Alex Garcia, a urologist and Cuban refugee who has lived in Atlanta for 34 years, said. “Sanders is more extreme, Hillary is a little less so, I like that,” Connor Wheatley, 21, from Gainesville, Georgia, said. “As a first time voter, I was really excited to vote for her. Her debt free college plan is great,” Jacob Kanter, 20, a student living in Atlanta, said. At 8pm, cheers erupted as the television news announced that Secretary Clinton had secured a victory in Alabama. Though the crowd was not massive,the love for the Secretary was on full display. Meanwhile, Millennials of all backgrounds and races filled the Bernie Sanders campaign headquarters, spilling over into the hall at the Atrium on Sweet Auburn in downtown Atlanta, to watch the returns. The energy was high and enthusiastic, as only young people can have; and no one was discouraged by the vote in Georgia because they are looking at a total delegate count nationally. Several students said that Sanders’s honesty and policies are what they like, that he doesn’t say one thing and do the opposite, like so many politicians. “All of Sanders’s supporters know this is a delegate race and we are looking at the long haul, not the short race. Even if it doesn’t come out the way we want in Georgia, we are all in to make sure the states that come after us go for Bernie,” State Rep. LaDawn Jones (D-Atlanta), State Director for Bernie Sanders in Georgia, told APN. Jones believes that when Black voters become more familiar with Sanders and his policies, they are going to be convinced, as she was, that Sanders is the right candidate. “I think Bernie has already transformed the county… by motivating a new generation of voters. Every movement, every revolution, every transformative change has been carried on by young people. Sanders has already transformed civic engagement and how we see our political process,” Daniel Blackman, Georgia Political Director for the Sanders Campaign, and a former candidate for Public Service Commission, told APN. Young people are using social media to transform politics; they see their role and have found their voice for democracy, and are active not just for Bernie, but also in many social issues today, Blackman observed. Daniel Hanley, a grassroots organizer, sees energized young people all over town who are voting for Sanders, phone banking, canvassing, and organizing to build toward something bigger. “I think the Democratic Party and maybe even democracy in America is at stake now. We’re deciding if billionaires are gong to control the Democratic Party, which is supposed to represent the working class,” Scott Brown, a grassroots volunteer for Sanders, told APN. “If money keeps having such a huge influence in electoral politics… then Bernie may be our last chance to get out of this plutocracy,” Brown said.